Best of the Week: Sky Soundbox, Sony WI-1000X, Xbox One X and more | What Hi-Fi? A round-up of this week's highlights, featuring news and reviews on products from Sony, McIntosh, Denon, Pro-Ject and more. This week McIntosh took the covers off the MA252 hybrid integrated amplifier, Denon revealed a new line of Envaya wireless speakers and Pro-Ject updated its VC-S record cleaning machine with the Mk II revision. 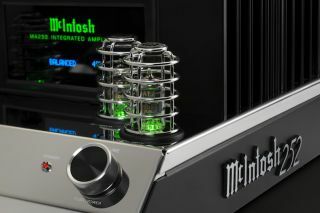 McIntosh's MA252 is a preamplifier that combines both valve and circuit technologies in one unit. Housing two 12AX7a and two 12AT7 valves inside protective cages, its solid-state output stage delivers 100 or 160 watts-per-channel into 8 ohms or 4ohms respectively. It costs £4,500 and goes on sale in December. And it looks stunning. Denon's new range of Envaya wireless speakers comprises the Envaya, Envaya Mini and Envaya Pocket. The Envaya is the largest unit, the Mini smaller and less powerful, while the Pocket is portable. All three have aptX Bluetooth and can be paired to play in stereo. Each has a carry strap and comes in grey or black finishes. The Envaya sells for £170, the Mini £130 and the Pocket £90. The second generation of Pro-Ject's VC-S record cleaning machine comes with a number of upgraded features. The motor has been replaced by a lower-noise variant, there's a redesigned steel clamp to hold the record in place, and the plastic flange has been improved for a smoother adjustment of the vacuum arm. What's more, Pro-Ject says the fluid used to clean the record now evaporates without leaving any residue on the record. All told, it should be better at cleaning your vinyl. The VC-S Mk II is available now for £350. "If you’re all geared up for 4K and want the most capable, all-in-one console currently available, this is it"
Microsoft's Xbox One X produces a detailed and immersive 4K image that's complemented by a bright and punchy HDR performance. The streamlined interface is a big improvement over the old one and there's support for Bitsream audio. However, there are better and cheaper dedicated 4K Blu-ray players and the huge 4K game sizes mean you could really do with an external HDD. It's not flawless by any means, but so long as you have a 4K TV, it's the most capable console out there and a compelling 4K all-in-one machine. "Though similar to the WF-1000Xs, they have just a bit more juice and musicality"
Sony's truly wireless WF-1000X earphones offered great sound, but the WI-1000X might be even better - albeit, there's a cable. It has a similar sonic character to the WF-1000X, with punchy bass, insightful midrange and a well-balanced sound. We also like the range of noise-cancellation modes on offer. Bearing in mind that the neckband can be inflexible and the WI-1000X costs more than the WF-1000X, it's a case of different strokes for different folks. "For existing and potential Sky customers, the Soundbox is a positive success"
Somewhere between a soundbar and a wireless speaker, Sky's Soundbox is a good attempt at improving your TV sound. It's a well-built unit with a clear, expressive and wide soundstage. There's a bevy of connections and the deep integration with Sky Q is a plus for Sky customers. It's not all great news, though. It is somewhat awkwardly-shaped, Dolby Atmos isn't supported and non-Sky customers will need to pay a premium for it. If you're a Sky customer it's a great fit. For others there are cheaper and better alternatives.